Author: Hassane Benamara. Series edited by: Harry Stroomer. Popular and simplistic intellectual discourses have it that the oasis town of Figuig might be the sole place in the world that did not generate poetry – an assumption that is justified either with the climatic and economic conditions of the region, or with historical events such as the colonial war, which are apparently considered as impediments to the emergence of poetry. As if the sole human capable of creating poetry was the one living an opulent life!, remarks Hassane Benamara, and eventually proves otherwise. According to him, it will suffice to comb through memories and to scrutinise the people’s everyday behaviour in order to recognize the presence, if not omnipresence, of poetry – which is rather stimulated than hampered by deprivation, pain and suffering. In addition to volume 34 of the series Berber Studies, which contains 51 Amazigh texts of the Figuig region, the present book is dedicated to the poetry of this oasis town in the farthest southeast of Morocco. The author had initially planned to confine himself to the modern Figuig poetry only, but broadened the scope of his work to include the ancient poetry of the region as well, since it remains nearly undocumented and runs the risk of being forgotten under the cultural influence of new media of communication, formal education and massive emigration. Thus, the first part of the present work consists of a corpus of ancient poems collected by Benamara with the aid of numerous informants; the second one contains pieces composed by contemporary poets. Whereas the former part exceeds a mere recording of the ancient works of poetry in that the author attempts at fathoming the rules underlying this poetry, its function, as well as other character­istics such as the contexts of its production, Benamara abstains from descriptions and analyses in the latter part, which simply presents the works of the modern Berber poets including their translations into French, leaving further interpretations to the interested reader. Even if the corpus published by Benamara – as he himself admits – constitutes only the tip of the iceberg of Figuig poetic art, his contribution to the documentation and preservation of this neglected part of Berber oral literature cannot be overestimated. 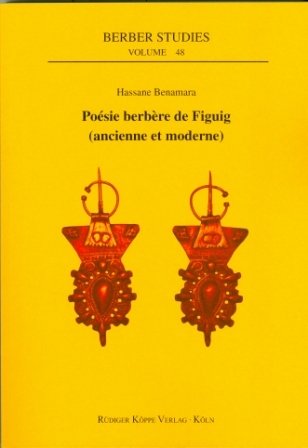 In conclusione, il lettore può essere grato a Hassane Benamara per aver dato vita a questo volume che offre una affascinante selezione poetica e propone une serie di piste di ricerca che speriamo l’autore stesso o altri ricercatori possano perseguire in futuro.